The Apple iPhone 2.0 and later comes with a preinstalled ActiveSync client. This software can be used to synchronise E-Mail, contacts and appointments between the iPhone and the Open-Xchange Server. The iPhone supports multiple folder support, this allows you to access all you personal groupware data, even if it is present in a secondary calendar, address list or E-Mail folder. 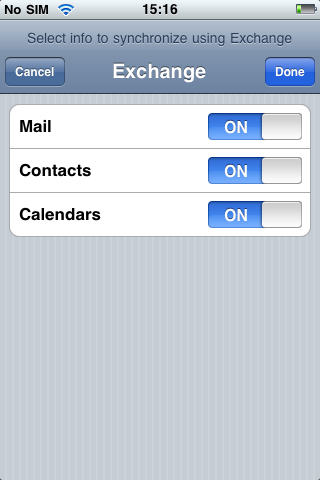 Navigate to the Settings application and select "Mail, Contacts, Calendars". 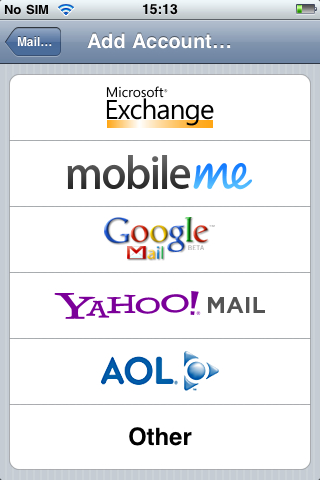 Tap the Microsoft Exchange logo to add your Open-Xchange account to synchronize with your iPhone. Enter your Open-Xchange account credentials. For the Server, enter ox.domain.com where domain.com is the domain name you subscribe, make sure ox.domain.com is pointed to correct IP. If your domain name not yet fully propagate, may follow below step to get your Open Exchange Mail server's IP address. Access to http://cachecheck.opendns.com/ , enter ox.yourdomainname.com to get your IP address. If your account name contains an '@', enter the first part to the 'Username' field and enter the second part to the 'Domain' field. For example: the account 'mike@ox.io' becomes user: mike, domain: ox.io. Also enter your Open-Xchange password, these credentials will be used to authenticate against the Open-Xchange Server and to access your data for synchronization. Select the applications available at the iPhone to enable synchronization with the counterpart modules at Open-Xchange Server. 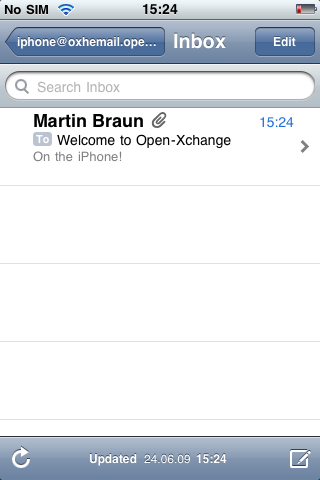 Your Open-Xchange E-Mail is synchronised to a separate E-Mail profile within the iPhone Mail application. This application supports subfolders and folder management, therfor you can manage all you Open-Xchange E-Mail data with it. The appointments of the Open-Xchange calendar are synchronised to the iPhones Calendar application. Note that this application is able to display multiple calendars so all your schedule from different personal calendars at Open-Xchange Server is available at your mobile. 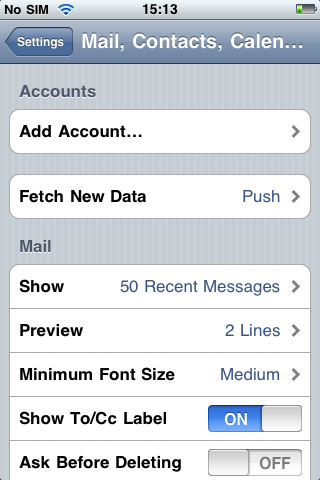 The iPhone also synchronizes all your personal contact folders to its Contacts application. Note that all personal contact folder are available as well as the global addressbook which can be accessed by a search lookup.